Join us for a community gathering to honour Trans Day of Remembrance (#TDOR). Taking place at ​Orillia City Hall (50 Andrew Street South) in the Tudhope-McIntyre Boardroom (on the main floor) from 6 PM – 8 PM. Light snacks and refreshments will be provided. This community gathering is open to all. Attendees will be welcome to share their thoughts, support one another, and reflect. Trans Day of Remembrance was set aside to memorialize those who were killed due to anti-transgender hatred or prejudice. The event is held in November to honor Rita Hester, whose murder on November 28th, 1998 kicked off the “Remembering Our Dead” web project and a San Francisco candlelight vigil in 1999. Rita Hester’s murder — like most anti-trans murder cases — has yet to be solved. 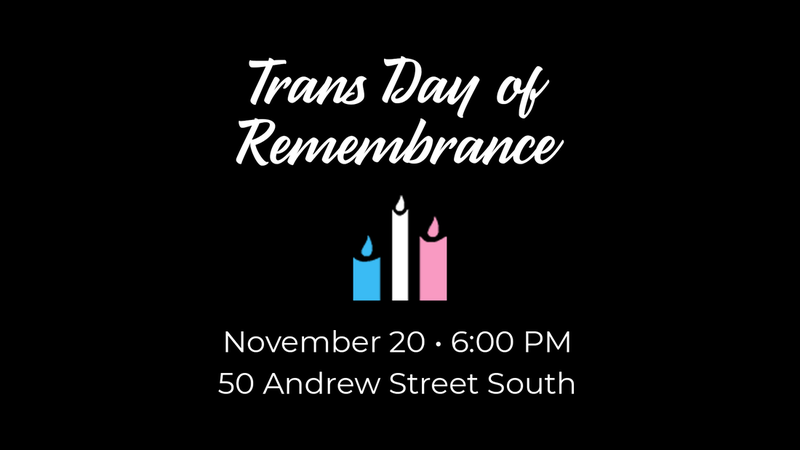 TDOR honours the memory of those who have been killed, lost, or have struggled as a result of transphobia and the hatred or fear of trans people.